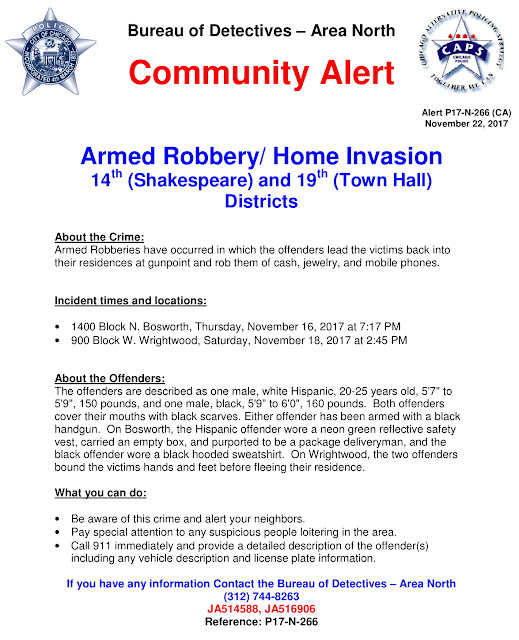 Two armed home invasions, one in Lincoln Park and the other in West Town, have been connected to the same offenders, police say. Now, a community alert has been issued. On Saturday, two men approached a Lincoln Park man on the side of his residence in the 900 block of West Wrightwood around 2:45 p.m. and forced him into his apartment. Once inside the unit, the robbers bound the victim’s hands and feet before searching his home for valuables. An iPhone, $300 cash, and a silver ring were taken. Two days earlier, the same men posed as delivery drivers to gain access to a woman’s apartment in the 1400 block of North Bosworth, the alert said. As in Lincoln Park, the men reportedly walked along the side of the West Town victim's home and approached her as she stood outside with a dog around 7:15 p.m. At the victim's door, the two turned violent, pushing the woman into the apartment at gunpoint. One of the men pistol-whipped and punched her in the face, police said. The two then demanded money from the woman and searched the apartment for valuables before leaving. Police said one offender is a 20- to 25-year-old Hispanic man who stands about 5’8” tall and weighs about 150 pounds. The other suspect is male, black, about 5’10” tall and 160 pounds. Both robbers covered their mouths with black scarves during the home invasions. In West Town, the Hispanic man wore a neon green reflective vest and carried an empty box that he claimed was a delivery. That man wore a tie-dyed t-shirt in the Lincoln Park incident. Anyone with information about the cases is asked to call Area North investigators at (312) 744-8263.